Let Lacroix’s Butterfly Parade collection gently flutter its way onto your table. 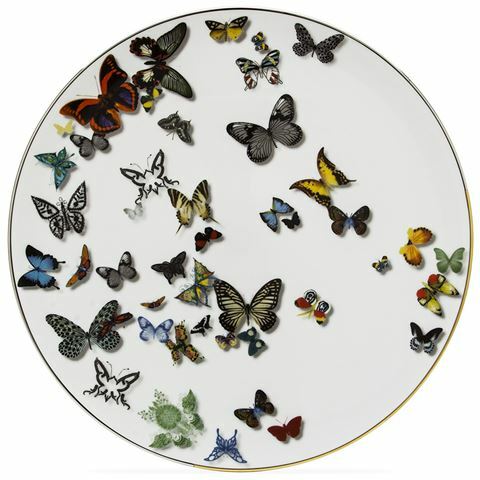 There’s just something about the delicate shadows beneath the wings of the butterflies adorning the Butterfly Parade range that makes this whimsical cascade of riotously colourful butterflies look as if it’s about to burst forth from the porcelain and into your dining room. Take an even closer look and you’ll notice that some of the intricate insects have fabric-like textures, as if they’ve been sewn from lace. Captivating in its detail, Butterfly Parade is utterly enchanting. Haute couture for the dinner table? Of course. Welcome to Maison Christian Lacroix. Crafted from glazed porcelain, and decorated with touches of gold and platinum.